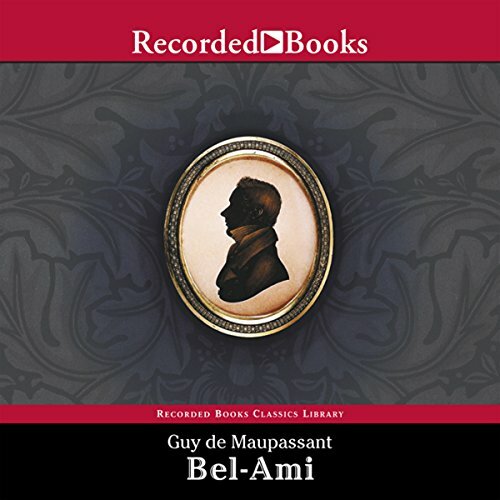 Bel Ami starts as a penniless returned soldier and by the end of the book after affairs and marriages he is one of the most powerful men in Paris if not France. He tramples on all he meets, money and position become everything and his sexual gratification is the cherry on the top. The women in the story seem to be strong but really are weak and bend to his every whim and it shows that the story is basically a story of human desire, weakness and determination. Maupassant was well know for his excellent characterisation and in Bel Ami the characters are brilliantly portrayed. Listening to my favourite Maupassant has really stimulated my hunger for more French literature which I have read extensively in my 30s. However, having it read to me gives it a whole extra layer of richness and complexity (and correct pronounciation of the French names and places!). This book is highly recommended - listen to it before you see the film. The movie has been given a bad review but if you go in knowing the story and the main characters you might get more from it. Certainly you will go in understanding better the times and morals and be less judgemental. I hope to see the movie myself shortly. Standby - I might add to this review after I have seen it! Typical Maupassant story of a young man developing his character during an earlier era.. A social commentary on the mores of the times with a fascinating narrative of a young man finding his way in the world when marital fidelity amongst the upper classes was accepted. Scary to think people like Bel Ami actually exist! I listened and listened and kept hoping one of the characters -- any of the characters -- would give Georges Duroy a good thrashing! If this story is any indication, Guy de Maupassant doesn't have a good opinion of women. Is there nothing he can do that would make them dump him?! Only one woman in this story had any self-respect, and even she gave in to him! In any case, while this was written in 1885, I could see the exact same story being written about people today. This book is extremely well written. I don't understand that it's not more popular and how it didn't find its way to compulsory school literature. Maupassant is a master story teller. Much more so than many other, far more famous, classic authors. I was absolutely delighted by this read. No wonder it is a classic. Bel Ami is a dispassionate , non judgmental and elegant description of people and society. The author keeps his distance and this makes the book more enjoyable and the characters more appealing and real. It could be a denunciation of the society of the time of just a portrait in any case it is done with such a mastery that this novel, even after two hundred years, it is very pleasant to read .